A mythic vision from a fantasy novel? No, this one really existed and was only destroyed relatively recently. 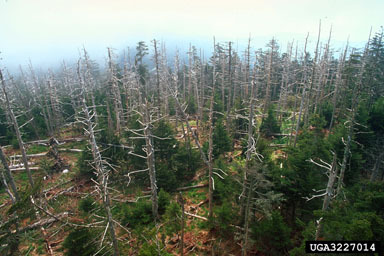 Here in the southern Appalachian mountains, this primeval forest survived until the late 19th and early 20th centuries. Now many of the inhabitants and visitors to this area, know nothing about it. Or at least don't think about what was on their property less than 100 years ago. My grandparents and great grand parents could remember. All the forests in western North Carolina that you see today are probably only 80 years old or less, only a few young saplings compared to what once was. Here at the Ranch the forest was totally logged, first in the early 1900s and then for the second time in the 1950s. All the woods here today are at most 50 years old. Many places were pasture only 15-20 years ago. We are fortunate to live in an area where a significant portion of the land around us is protected from development. Haywood County contains a section of the Great Smoky Mountain National Part, the Shining Rock Wilderness Area, and the Pisgah (pronounced piz-gah) National Forest. Thanks to this, inhabitants of our area, especially the Ranch which is surrounded on all four corners by the Pisgah National Forest including a bear sanctuary, are still aware of the forest around them.